Climb the distinctive buttress left of the Gym Arete. A stout beginning leads to good pockets, including the best mono at Shelf. A final crux off a poor undercling leaves most dangling 10 feet lower. This is a must do for the grade, even if there is still some debate regarding the grade and the "true" line. Colin Lantz on The Example. One of the best pocketed routes around! Chris Kanes on the crux of The Example. I concur with the original 13a/b rating. This route is considerably harder than other a's at shelf, and more in line with many of the so-called b's...I'm a little short though. It's nice because it's actually not a one-move wonder like most the other hard routes at Shelf. 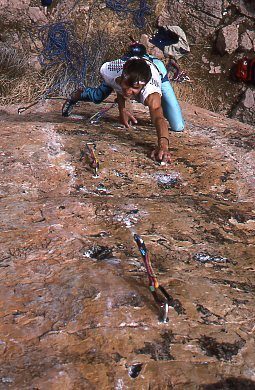 I did the FA of this in the summer of 1988 just before going to the first International Sport Climbing Competition at Snowbird, Utah. I climbed straight up at the crux and did not traverse out right. If you traverse out right you are on the Gym Arete. It never occurred to me to do this. Evidently, a lot of folks doing early repeats of the route traversed out right which avoids the crux, hence the early downgrading of the route. The logical, "true", and original way to climb the route is straight up. The picture below is from the same day I did the redpoint. If you look closely you can make out that I am clipped in directly to the donut on my harness. I had called in sick at work to go down to Shelf to do the route and had begged Chip Ruckgaber to come and give me a belay. I really wanted to get a picture but the problem was we were only two, so...I climbed up, clipped directly into a bolt and then Chip jugged up a fixed line and took a few pictures. You can see the rope laying on the ground and no belayer in sight. The route was named after a seriously heavy, very cheap, plate of nachos sold at a dive Mexican food stand in New Paltz, NY called The Last Stand. A favorite of mine for the high dollars to calories ratio, the menu listed nachos that you could order with any combination you wanted from a list of ingredients, and showed an example of a custom order. The "example" nacho plate became a specialty of the house and a climber favorite in the Gunks. The double entendre of the route name was not lost on me. There were a lot of really bad bolts from the construction industry and homemade bolt hangers made out of angle iron being used at Shelf during that era. I'd been to Smith Rocks once already and seen a much better quality of bolting there. I thought The Example would be a good "example" of how to bolt a route. A new pair of Dolomite climbing shoes from Italy made a huge difference for me on this route. Metolius had just started importing them to the states and the pointy toe made all the difference on the small pockets on the route. I was having a lot of trouble with the footwork on this route using my old Mariachers. When I got these shoes, which were designed by Patrick Edlinger specifically for the new style of "sport" climbing, the redpoint came quickly. I think the model was the Emotion. I went to France and climbed at Buoux and the Verdon for the first time later that year. I went in September and stayed for two months. I think I did the entire trip on about $500 including the plane ticket. The Example ended up being great training for the style of climbing found in Buoux. The painful sharp pockets on The Example were great for getting your skin ready for Buoux where calluses on the sides and tops of your fingers were carefully cultivated by the top climbers of the day.